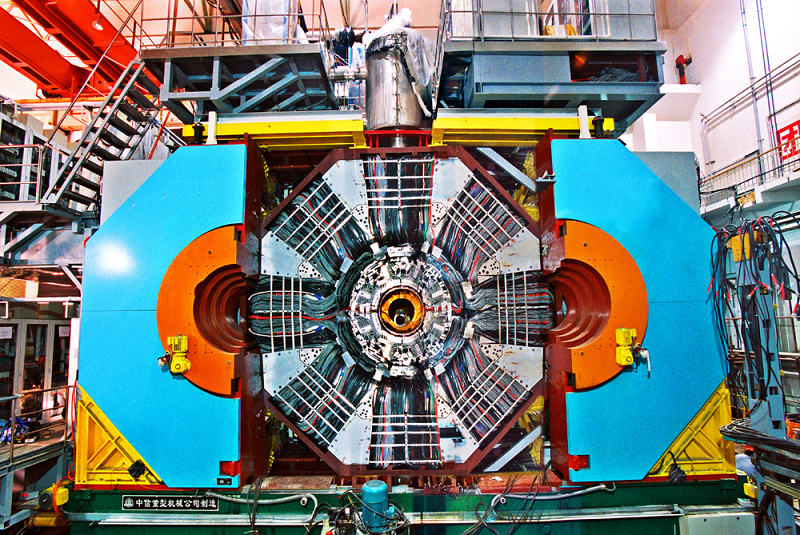 An international team of scientists operating the BESIII Experiment at the BEPCII electron positron collider in Beijing has announced the discovery of a new particle. This subatomic particle Zc(3900) has a mass similar to a helium atom and a lifetime of 10-23 seconds, i.e., a fraction of a billion of a microsecond. Johannes Gutenberg University Mainz (JGU) is participating in the BESIII Experiment through Collaborative Research Center 1044 – "The Low-Energy Frontier of the Standard Model: From Quarks and Gluons to Hadrons and Nuclei" funded by the German Research Foundation (DFG). This contribution is also part of the university’s Cluster of Excellence "Precision Physics, Fundamental Interactions and Structure of Matter" (PRISMA), which was recently approved for funding in the German Federal Excellence Initiative. In late December 2012, the BESIII team began a series of studies of the particle Y(4260), which had been originally discovered at the SLAC National Laboratory in Stanford, California in 2005. Unlike in previous experiments, the BESIII Experiment was able to produce this particle directly in electron positron collisions. As a result, already after two weeks of data taking, the team had collected data that surpassed all previously collected statistics. But the team was surprised when it turned out that Y(4260) unexpectedly decays to form the even more mysterious particle Zc(3900). Y(4260) could represent a class of subatomic particles, so-called psi particles, that are formed by the pairing of a charmed quark with an anti-charmed quark, i.e., the anti-matter of the charmed quark, bound together by the strong nuclear force. Using the generally accepted explanation of the strong nuclear force, the theory of quantum chromodynamics (QCD), to this date it has not been possible to predict the mass of such bound particles with highest accuracy, although there are QCD-based models that allow estimates. The existence of the Y(4260) particle is very interesting because its mass does not fit to any of the predictions for the psi particle spectrum. One explanation could be that Y(4260) is a new and not yet confirmed form of bound matter known as a tetra-quark. This would mean that this particle would contain, in addition to a charmed and an anti-charmed quark, two other forms of quark constituents. The QCD theory does in fact allow such four-quark composites. It is thus the objective of the BESIII Experiment to investigate the Y(4260) particle in more detail. One of the surprising findings was the fact that Y(4260) often decays to Zc(3900), a particle that, in contrast with its mother particle, has an electric charge. "This clearly demonstrates that we must be dealing with a bound state that does not consist exclusively of charmed and anti-charmed quarks. This is not so apparent in the case of Y(4260), because it is electrically neutral," explained Professor Dr. Achim Denig of the Institute of Nuclear Physics at Johannes Gutenberg University Mainz, Coordinator of the DFG Collaborative Research Center 1044. "Indeed, the four-quark hypothesis would be one way of explaining the existence of the Zc(3900) particle we have just discovered." In view of the new findings, the specialized investigations of the Y(4260) and the Zc(3900) particles in Beijing have been extended for another two months. "This will provide us with new insights into this fascinating discovery. Our team from Mainz will be actively involved," said Denig. In order to arrive at a deeper understanding of the nature of the strong nuclear force using the new experimental findings, it will first be necessary to generate precise theoretical predictions of the mass of both the Zc(3900) and the Y(4260) particles and other related particles. For several years now, attempts have been made using the so-called "lattice QCD" method to calculate the mass of such particles with the help of large-scale computer simulations. "The spectroscopy of psi particles represents a huge challenge to lattice QCD," stated Professor Hartmut Wittig, Coordinator of the PRISMA Cluster of Excellence in Mainz. "This very topical subject will be at the focus of discussions at the 31st International Symposium on Lattice Field Theory organized at the Mainz University in July and August 2013." Some 350 physicists from 50 institutions based in 11 countries, including China, the USA, Germany, and other European and Asian countries, are participating in the BESIII Experiment, a project concerned with hadron and particle physics.